At the time this photograph was taken, eight year-old Sangita was suffering from a fever after she and her family had spent over three weeks living beneath a yellow tarpaulin shelter. The family had lost their home in the 2007 monsoon floods and their crop of rice and sugar-cane had been destroyed by the rains that affected the lives of 38 million people across northern India. This photograph was commissioned by UNICEF and I was working alongside one of their relief teams who were distributing water-purification kits and providing medical treatment. Sangita’s temporary home was one of the more ridged structures in a collection of a dozen tarpaulin sheets strung out along a muddy embankment beside a flooded field. I am frequently shocked by the hardship that is suffered almost routinely by many rural Indians who have very little control over the destiny of their own lives. 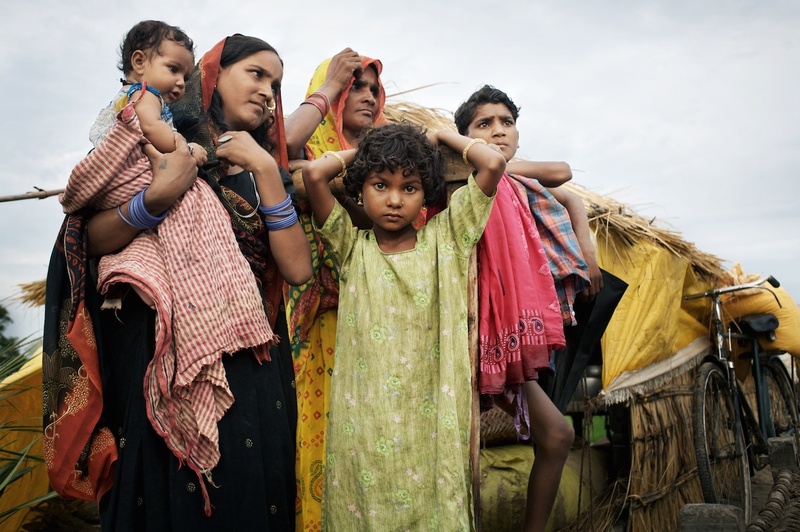 It is clear that until the benefits of India’s economic growth are distributed more fairly, millions of families like Sangita’s will continue to suffer unnecessary risk at the hands of disasters like the 2007 floods. This family portrait was exhibited last year in London’s National Portrait Gallery as part of the 2008 Taylor Wessing Photographic Portrait Prize. The closing date for entry to the 2009 prize has just passed and I have submitted the four photographs featured at the bottom of this post. There is always an element of luck in entering competitions, particularly when you consider that, in the case of last years Taylor Wessing Prize, the jury had to sift through over 5,000 prints. This advice is obviously intended to invite as broad a range of entries as possible. Indeed, of the four finalists in 2008, Tom Stoddart’s spontaneous and particularly unflattering portrait of Rupert Murdoch stood in stark contrast to an elaborate work by Lottie Davies which eventually won the prize. Her digitally constructed “Quints” featured a woman surrounded by five babies which was in fact one baby photographed five times over. I welcome the idea of diversity of style and also the exciting prospect of seeing how differently individuals interpret the idea of a ‘portrait’. Others undoubtedly feel the same way because any exhibition that is bound by such a loose and popular theme always attracts a large audience. But I do wonder about the effect on the viewer’s ultimate understanding and interpretation of a photograph when it is hung beside so many unrelated images. I’m sure that my portrait of Sangita and her family would have been considered very differently had it been viewed for instance, in an exhibition highlighting the effect of climate change on people’s lives. The detailed information I have quoted in italics above was submitted along with my photograph to the National Portrait Gallery but the caption that ran alongside the print in the exhibition was edited down to just a couple of sentences. In my mind this left too many questions unanswered. For some photographers this is exactly the effect they want. I can understand why those working at the art end of the photography spectrum might consider that caption information unnecessarily constrains a viewer’s interpretation of their work. And of course all good photography has the potential to elicit an emotional reaction that lies beyond explanation. But when an environmental portrait that directly raises an important and urgent subject is denied context or placed alongside work that has no relevance to it, surely good caption information is more important than ever. Despite these issues, I was of course very pleased that my portrait of Sangita and her family was chosen for last years exhibition and as a result was seen by so many people. It is for this reason that I have submitted four photographs to this prestigious prize in 2009. Though each of these portraits was taken in an environment or situation that is of relevance to the sitter, I don’t feel that any of them presents quite as urgent a need for explanation as the scene which surrounded Sangita’s family. It is for this reason that the captions I submitted this year are much shorter than last time around. You can read the captions below each photograph. The Taylor Wessing Prize judges announce their decision at the end of this month. 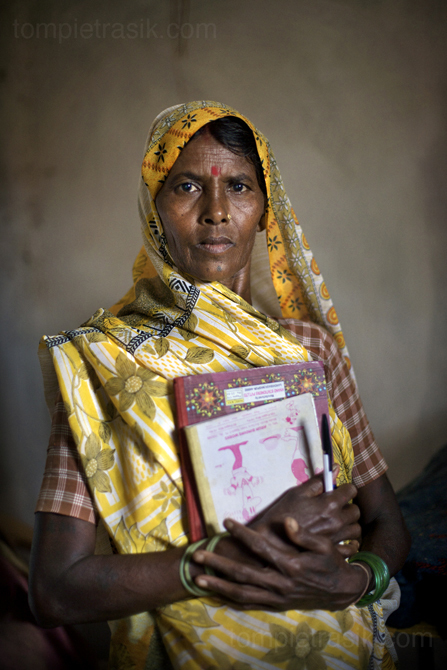 Ruhelin Bai Bagdaria is among a handful of literate women in a village where only one in four can write their name. Though she must undertake manual work in order to support her family, the ability to read and write affords Bagdaria special status among her neighbours. 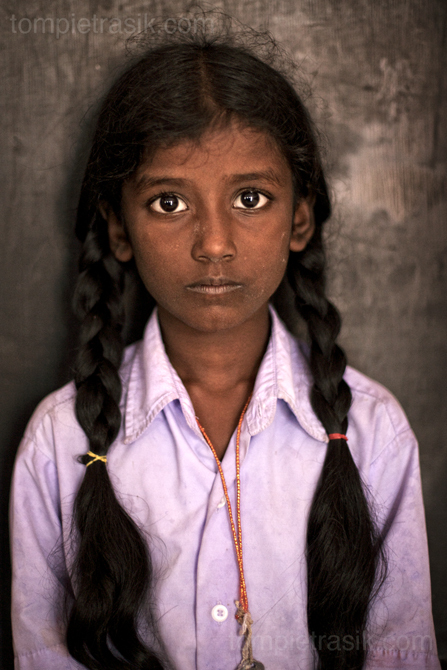 Ramani Sanmugam, aged nine, at school in Cuddalore. Geeta in her bedroom. 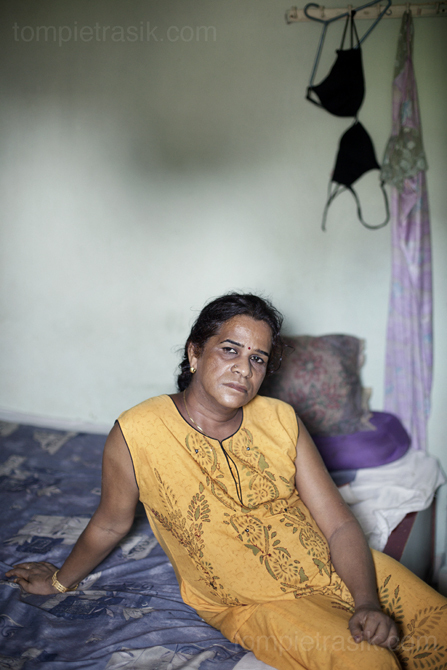 Geeta is the head of an Aravani (transgender) household in Chennai. Despite a recent series of legal victories, the Aravani community, to which Geeta belongs, remain isolated from the rest of Indian society. Ten-year old Shruda is HIV positive. She faces many challenges in life but benefits from the support of anincreasingly informed and confident Indian network of HIV positive people. Beautiful and thought provoking work. I was interested to read that you had included written context along with your entries to the Taylor Wessing Portrait Prize in 2008 and 2009. I agree that this is a useful addition but I have been unable to find any request for this information on the application form. Is this a recognised, if not stipulated practice when entering this particular competition? Thanks for your support. I don’t think the Taylor Wessing prize insists on a caption. And I do seem to remember some of the photographs exhibited last year were displayed without one. Most of the editors I work for are real sticklers for captioning. That of course has a lot to do with the nature of my photography. I always think photographs should raise questions and provoke debate and for the most part I would argue captions encourage this. Tom, the photograph speaks volumes. Moved me. Thank you for capturing this.